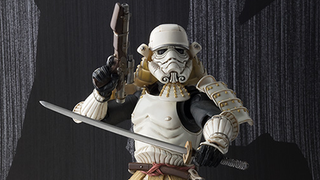 We've taken a brief look at Tamashii Nation's Japanese take on the Empire's footsoldiers before, but now Bandai have released official images of their Ashigaru Stormtrooper, and he looks wonderful. The 7 inch figure won't be out until March of next year, and will come with a cool, old-school style take on the E11 Blater rifle, and also a Katana, because you know. Samurai! Gotta have one. It's a really cool blend of east meets west in a way the Samurai Taisho Vader doesn't work as well for me - but that might just be my Stormtrooper love talking. They do look pretty awesome all together though. The Movie Realisation Stormtroopers will set you back 8,424 yen (around $70). For now, there's more pictures to gawp at at the link below.